Can I take my pet with me to Cyprus? Please click here to download the provisions governing the non commercial movement / entry of companion animals into the territory of the Republic of Cyprus. Can foreign nationals take up employment in Cyprus? EU citizens who wish to be employed in Cyprus do not need a work permit, but a residence permit is necessary if their stay will exceed the 3 months. In that case within the first 3 months of their arrival in Cyprus, they have to apply for a residence permit (for 6 months stay, temporary residence permit is needed) at the Migration Officer in Nicosia. The following must be submitted: a) 2 photos, b) a valid passport or ID card, c) a health certificate, obtained either from the Cyprus hospitals or from their home country (in this case the documents must be certified) and d) an employment certificate, issued by their employer, stating the nature of the job and the emloyment period. The fee for the issue of a residence permit is CYP 5,00 (10,30 Euro). Nationals of third countries (non-EU countries)may be employed in Cyprus provided they can first find a local employer who is willing to employ them. The Cyprus employer must then submit an application for the issue of a work permit, on behalf of the foreign national, to the competent authority (i.e. the Immigration Office at the Ministry of Interior). If the application is approved the foreign national will hold a work permit for the specific job and for limited period of time (please note that work permits are not general and are not valid indefinitely). Recruitment is therefore made directly by the employers or through agents; you have to make your own direct contacts with interested employers, intermediaries or employers' organisations if you wish to take up employment in Cyprus. Can a foreign national visit the north part of the island, which has been under Turkish military occupation since 1974? Last year's developments in Cyprus following the partial lifting of restrictions on the freedom of movement, that have been imposed by the occupation regime since 1974 in the occupied area of the Republic of Cyprus, have wrongly created the impression that the occupation has ceased and a solution to the Cyprus problem has been reached. As this is not the case, the purpose of this document is to make people aware of the situation as regards visits to the occupied area and to alert them as to the potential problems and risks they may face. At the outset it should be noted that the Government of the Republic of Cyprus does not impose any restrictions on the freedom of movement of persons or goods, which have entered the territory of the Republic through legal points of entry situated in the Government controlled areas of the Republic. Entry into the territory of the Republic of Cyprus through any illegal point of entry situated in the occupied non-government controlled areas is illegal and subject to the relevant laws of the Republic. The authorities of the Republic of Cyprus maintain their position that all properties situated in the occupied area of the Republic of Cyprus including hotels, restaurants, shops and other establishments, are not evidently owned, controlled and managed by their legal owners. These properties have been illegally aliened by the occupation regime to people that manage them, without the consent of their rightful owners. The conscious use of such property and particularly overnight stay in the aforesaid hotels or other resorts is illegal and subject to the laws of the Republic regarding the conscious use of stolen property. Overnight stay in the occupied areas is also strongly discouraged for reasons of compatibility of the establishments in the occupied area with the hygienic, security and other standards. 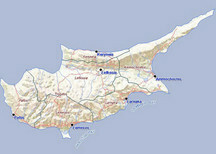 The Republic of Cyprus cannot guarantee the standards or safety of the establishments in the north of Cyprus. Any claims for compensation based on established European consumer protection acts can be denied by the occupation regime as Turkey’s subordinate local administration in the occupied area of the Republic is deprived of any legal status. Furthermore the laws of the Republic of Cyprus and the Acquis Communautaire cannot be enforced, as this is a non-government controlled area. The Government of the Republic of Cyprus cannot guarantee or ensure the safety of visitors in the occupied areas and the authorities of the Republic will be unable to offer any help in case of accident, injury, theft, illness etc. and thus foreign nationals may find themselves isolated in the case of need. As Turkey's subordinate local administration in the occupied areas does not enjoy any international recognition and hence is deprived of any legal status, it is not feasible to obtain recognized evidence to support any claim. According to Article 6 of the Travel Agencies and Tourist Guides law, tour operators that bring tourists to Cyprus are obliged to have a licensed Cypriot travel agent as a representative. Article 12 of the above law places a responsibility of the Cyprus Tourist Organisation to oversee travel agencies and ensure that they follow and apply the conditions of their license. The travel agencies are obliged to submit to the CTO all promotional material or programs for planned excursions / sightseeing tours for approval and the organisation of such excursions / tours without the use of licensed tourist guides is not allowed. Andorra, Argentina, Australia, Austria, Belgium, Bolivia, Brazil, Brunei Darussalam, Bulgaria, Canada, Chile, Costa Rica, Croatia, Czech Republic, Denmark, El Salvador, Estonia, Finland, France, Germany, Greece, Guatemala, Honduras, Hungary, Iceland, Ireland, Israel, Italy, Japan, Latvia, Liechtenstein, Lithuania, Luxembourg, Malta, Malaysia, Mexico, Monaco, Netherlands, New Zealand, Nicaragua, Norway, Panama, Paraguay, Poland, Portugal, Republic of Korea (South), Romania, San Marino, Singapore, Slovakia, Slovenia, Spain, Sweden, Switzerland, United Kingdom, United States of America, Uruguay, Vatican City, Venezuela, Hong-Kong Special Administrative Region (the exemption concerns only the holders of HKSAR passports) and Macao S.A.R. (the exemption concerns only the holders of Macao S.A.R. passports) provided they are in possession of a valid passport. However, a valid passport with a visa is required for the nationals of all other countries. Detailed information on how to obtain a visa is available in the Consular Section of this website. Can I get a residence permit or a long-term visa for Cyprus from the Embassy? Embassies of the Republic of Cyprus are only authorised to issue tourist/visitor visas with a maximum duration of 90 days. Anyone wishing to stay on the island longer for any reason should enter Cyprus as a tourist and apply to the Immigration Authorities in Cyprus for an extension of stay, explaining their reasons. Please note that student visas are usually arranged for by the relevant Educational Institutions (for work permits please see relevant answer above). How is the income (pension and other) of a foreign national who moves to Cyprus after retirement taxed? 1. With the tax reform approved by Parliament in July 2002, Cyprus has adopted the principle of taxing its residents on their worldwide income. The definition of «resident» for individuals entails a total stay of 183 days, in a particular year of assessment, in Cyprus. There is no income tax on dividends and interest received by individuals. However, such income is subject to special contribution for the defence at the rate of 15% for distributed dividends and 10% for interest. 4. There are no personal allowances. 5. In cases where the income subject to tax in Cyprus, is also taxed in the country of source, a tax credit in respect of the foreign tax paid, is allowed against the Cyprus tax but the credit should not exceed the Cyprus tax. 6. Husband and wife are separately assessed to tax in Cyprus. Can foreign nationals have a civil wedding in Cyprus? If yes, what is the relevant procedure? Yes, foreign nationals can celebrate their civil marriage in Cyprus. Detailed infromation as to how and where this can be done is available at the relevant section of the Union of Cyprus Municipalities website.